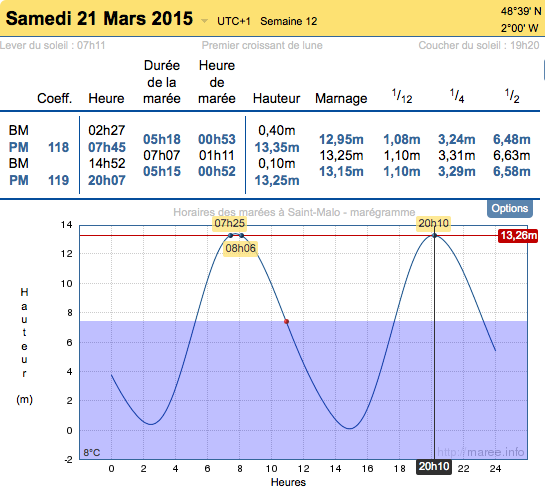 Storms and high tides in Saint-Malo (Brittany, France) from Easy Ride. The bay of St Malo knows among the highest tides in the world. The so-called "tide of the century" in fact happens every 18 years. creating a high point in the 18-year lunar cycle. Thousands of people gathered at Mont Saint-Michel in northern France on Saturday to watch what is being called "the high tide of the century". The exceptionally high spring tide, swollen by a "supermoon" effect linked to the solar eclipse on Friday, was predicted to cut off the picturesque island from the mainland with a wall of water as high as a four-storey building. Friday’s tidal surge was not as high as the 46 feet predicted, and a tiny sliver of causeway no more than a few metres wide resisted the surge of water pushed by the moon's huge gravitational pull on the sea. However, Saturday's tide on the long, sloping estuary of the River Couesnon could yet go higher, although scientists said low air pressure may have lessened the phenomenon. As the surge began to make its way along the coast and tidal estuaries surfers took to the water in Pontaubault and waves crashed onto seawalls. The moon acts as a magnet on the oceans. Its force of attractions is twice as strong as that of the sun. The sea advances and retreats twice a day with a time shift of 50 minutes each day. When the moon is above the sea, it attracts the water towards it and so the sea level rises and the tide comes in. Six hours later, the moon is no longer above the sea and the force of attraction disappears. The tide then goes out. The power of the force varies depending on the positions of the sun and moon respectively in relation to the earth. When the three are aligned the attraction is at its peak. This is the time of the high tide : during this period the sea advances and retreats the farthest. Police had difficulty holding back the 10,000-strong crowd eager to get pictures of the scene in the final minutes before the surge on Friday evening, with the tourist hotspot lit up as night fell with 60 spotlights for the occasion. Mont Saint-Michel, which was named a UNESCO World Heritage site in 1979, is situated one kilometre off the coast of Normandy. The rocky outcrop is home to the famous Norman Benedictine Abbey of St-Michel. Michael Dodds, the director of the regional tourism committee, said: "This natural phenomenon is an incredible opportunity for tourism in Brittany at this time of year." Highest tides at Mont Saint-Michel seen by drone from FLY HD. On February 21 the tidal coefficient reached 117. The Mont Saint-Michel 11th century abbey is expected to be entirely surrounded by the English Channel with waters rising by a staggering 14 metres. "The eclipse and the tide are linked" said Kevin Horsburgh, head of the Marine Physics and Ocean Climate research group at Britain's National Oceanography Centre (NOC). "For an eclipse to take place, the sun, the Earth and the moon need to be in a straight line, which is also an essential condition for high tides," he added. The bay on the coast of Normandy has some of the strongest tides in the world. Eleven departements along the coast of northern France are on alert for fear of flooding and residents have been told to stay away from beaches and coastal areas. Similar surges are predicted along the coast of Britain and the Netherlands over the weekend. The last ‘tide of the century’ was on March 10, 1997 and the next will be on March 3, 2033, making the description something of a misnomer. The predictions are based on the tide coefficients used by scientists to forecast wave size. With 120 being the highest, they project a 119 on Saturday. Until 1879 Mont Saint-Michel was cut off from the mainland during each high tide. That year a permanent causeway was built to prevent the tide from scouring the silt around the island. The coastal flats were reclaimed for pastureland, reducing the distance between the shore and the island. The effect was to encourage the silting-up of the bay. In 2009 work began on building a hydraulic dam using the waters of the river Couesnon and the tides to help remove the accumulated silt, and make Mont Saint-Michel an island again. Last year a new 2,500ft bridge was opened to the public. The bridge allows the waters to flow freely below and around the island at high tide. Parts of the world will witness a solar eclipse on Friday – a rare phenomenon in which the sun is completely obscured by the moon. Here’s everything you need to know about the background of the solar eclipse, where to view it and how. Records show that the Babylonians and the ancient Chinese were able to predict solar eclipses as early as 2500 BC, but it was a phenomenon that confounded ancient civilisations for centuries. The Greeks believed that the solar eclipse was a sign that the gods were angry and death and destruction were on their way. In fact, eclipse comes from ekleipsis, an ancient Greek word that means obscured, or abandoned. In ancient China, the eclipse was seen to foretell the future of the emperor. More than 4,000 years ago, two Chinese astrologers were executed for failing to predict a solar eclipse. The Chinese people would get together during an eclipse to bang pots and pans to scare away any demons. A variety of cultures thought the eclipse was a result of entities devouring the sun. In Vietnam, it was thought that a giant frog was eating it, while the Vikings thought it was the fault of wolves. Meanwhile, according to ancient Hindu mythology, the eclipse happened when the deity Rahu was beheaded by the gods for drinking ambrosia. Rahu’s head was said to have flown into the sky, where it swallowed the sun. Superstitions surrounding solar eclipses still exist today. Many believe that solar eclipses can be a dangerous to pregnant women and their unborn child – a claim that scientists have debunked. In parts of India, people fast during a solar eclipse because they believe that any food cooked during the time will be poisonous, and in Italy it is believed that flowers planted during a solar eclipse are more colourful than those planted at other times of the year. How often does a solar eclipse take place? A solar eclipse can only happen at new moon, when the moon directly blocks sight of the sun from certain places in the world. It can take place up to five times a year, though according to Nasa, only 25 years in the past 5,000 have had five solar eclipses. In the last 500 years there have only been eight total solar eclipses that could be seen from the UK. The last one was in 1999, when thousands of people travelled to Devon and Cornwall to see it. The UK will not see another eclipse until 2090. This animation (DailyMail) is designed to appear from the 'point of view' of the eclipse as it will occur on March 20. The solar eclipse will take place at around 8.45am GMT and is due to last for a few hours. Most of it will go unnoticed because its path falls over the North Atlantic and Arctic Oceans. It will start in Greenland and move counterclockwise towards the northeast, passing over Iceland and the UK. Phases of the eclipse will be visible from everywhere in Europe, most of northern Africa, western Asia and parts of the Middle East. Saint John’s in Newfoundland, Canada, will also see a small bit of the eclipse at sunrise, but the rest of North America will not be able to view it. The sun will be completely blocked out on the Norwegian islands of Svalbard, where some hotels have been booked out for the event since 2008. One of the best places to view the eclipse will be the Faroe Isles, 200 miles (321km) off the north coast of Scotland, where the moon will cover about 98% of the sun. In the UK, the sun will be about 98% covered on the Isle of Lewis and about 97% on Shetland. In London, the eclipse will be at its deepest at about 9.30am, in Manchester at 9.32am and in Edinburgh at 9.35am, though this is subject to weather conditions. The eclipse time for cities in Europe is available on eclipsewise.com, complete with a map of times and locations. Observers must take care when taking photos of the eclipse on digital devices, as eye experts have warned that doing so could cause blindness. Skygazers have been told to not look directly at the sun when they take selfies and other photographs, as doing so can lead to burns at the back of the eye, even with the use of dark sunglasses. Though looking at the eclipse on a screen is not dangerous in itself, it might lead to inadvertently looking at it in the process of trying to capture the perfect shot. When viewing the eclipse, you can use a homemade pinhole camera and face away from the sun. Londoners can also go to the Royal observatory in Greenwich from 8am, where they can join expert astronomers. Other places setting up special equipment for viewing include the Flamsteed Astronomy Society, the Royal Astronomical Society, Baker Street Irregular Astronomers, the Hampstead Scientific Society and Northolt Branch Astro. Alternatively, the eclipse can be witnessed from your home, as it will be broadcast live online through the Slooh Community Observatory’s website, slooh.com, from 8.30am. Scientific implications In 1851, the first photograph of the sun’s corona was taken by the Prussian photographer Berkowski during a solar eclipse. An eclipse also led to the discovery of helium in 1868 by the French astronomer Pierre Janssen and the British scientist Norman Lockyer, which is why it is named after the Greek word for the sun – helios. And in 1919, a solar eclipse was used by the British astronomer and mathematician Sir Arthur Eddington to prove Einstein’s theory of general relativity. For the latest eclipse, hundreds of astronomers are already stationed on Svalbard. 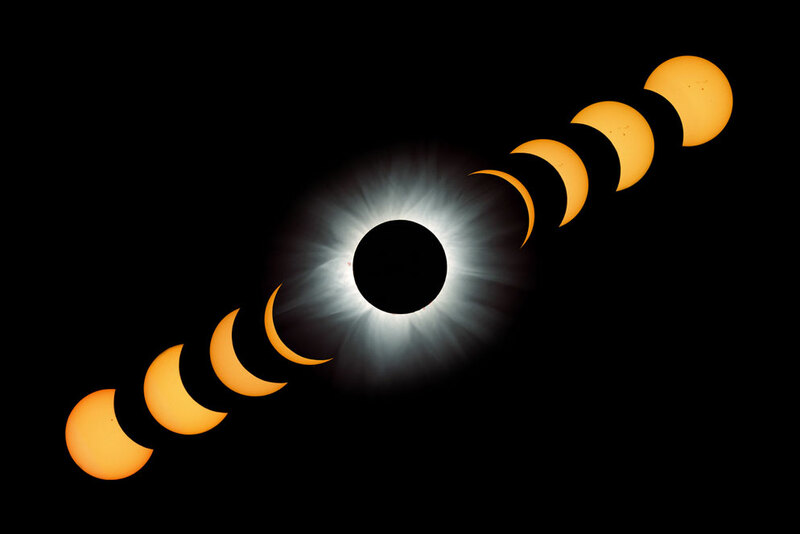 Solar eclipses provide a unique opportunity to study the sun’s atmosphere – the corona – which is much easier to observe with most of the sun’s light blotted out. One of the biggest mysteries in astronomy is why the corona is so hot. While the surface of the sun is only about 6,000C (a few times hotter than a blast furnace), the corona reaches 1-2mC. The heat is not coming from the surface and scientists are working on a plausible explanation for what causes its astonishing heat. One explanation is that twisting magnetic field lines could cause heating, but more observational evidence is needed. The UK has 5GW of installed solar capacity, the equivalent of eight to 10 very large coal power plants. If skies are clear on Friday morning, the European grid will suddenly lose all this power. However, since the event is known about in advance, electricity grids are expected to cope well and no power blackouts are expected. In addition to the solar eclipse, Friday is set to see a supermoon and a spring equinox. A supermoon refers to the moment the moon orbits at its closest to the Earth, making it look bigger than it normally does. The spring equinox is the time of the year when night and day are of equal length, mid-way between the longest and shortest days of the year. It is a sign that the Earth’s axis is perpendicular to the sun’s rays. Some Christian ministers have viewed the rare collision of three celestial events as the beginning of the end of the world. British Prime Minister David Cameron's government announced the creation of the world’s largest contiguous ocean reserve on Wednesday, setting aside 322,000 square miles (830,000 square kilometers) around the remote Pitcairn Islands in the South Pacific for special protection. The new reserve is nearly three and a half times bigger than the landmass of the United Kingdom—larger than the state of California—and is home to a stunning array of sharks, fish, corals, and other marine life, says Enric Sala, a National Geographic Explorer-in-Residence who led a five-week Pristine Seas expedition to the island group in March 2012 that helped establish a scientific case for the reserve. The Titan triggerfish, a voracious predator, being cleaned by a cleaner wrasse. Announced via the government's 2015 budget, the reserve represents a bid by the U.K. to thwart the illegal fishing that threatens the species in its territorial waters. No fishing or seafloor mining will be allowed in the reserve, except for traditional fishing around the island of Pitcairn by the local population, says Sala. The reserve's creation is dependent on partnerships with non-governmental organizations and satellite monitoring resources, according to the budget. Those resources are already in place, says Sala. Thirty percent of the U.K.’s waters around the world are now protected, the highest percentage of any country’s waters on Earth. 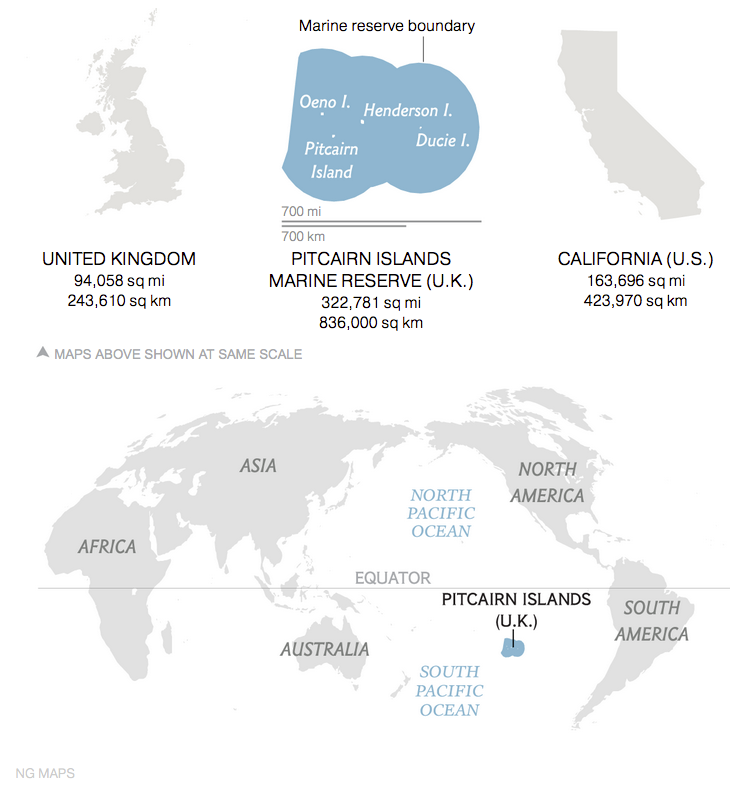 Although the new reserve will become the largest single marine protected area anywhere, the network of reserves created around the Pacific remote islands by the U.S. in September is bigger in total, at nearly 490,000 square miles (1,270,000 square kilometers). In 2012 National Geographic's Pristine Seas project went on an expedition to the Pitcairn Islands—a legendary and remote archipelago in the middle of the Pacific Ocean—and returned with footage of incredible natural wonders underwater and on land. 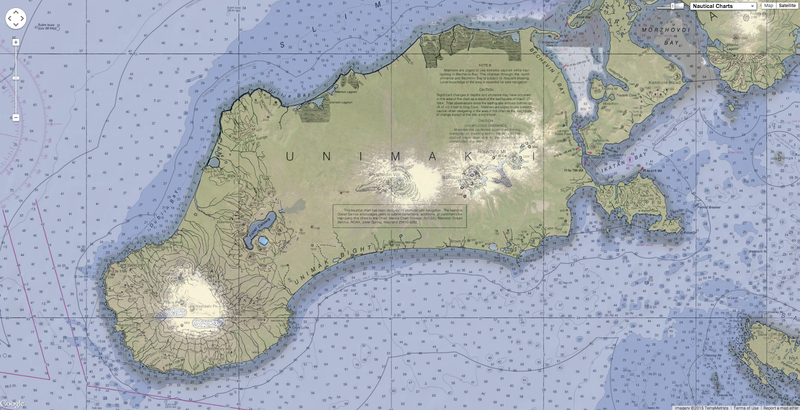 The expedition led to the historic announcement that the British government has created the largest contiguous marine reserve in the world, protecting this one-of-a-kind ecosystem. The Pitcairn Islands are some of the most remote on Earth. The surrounding waters contain intact deep-sea ecosystems, and their coral reefs harbor abundant sharks and large fishes. In March 2015 the U.K. government established the area as a no-take marine reserve—the largest single reserve in the world. “People know Pitcairn because of the Mutiny on the Bounty, but their real bounty is the rich marine life underwater,” says Sala. About 60 people live on Pitcairn Island, most of them descendants of the Bounty mutineers from 1790 and their Tahitian companions. 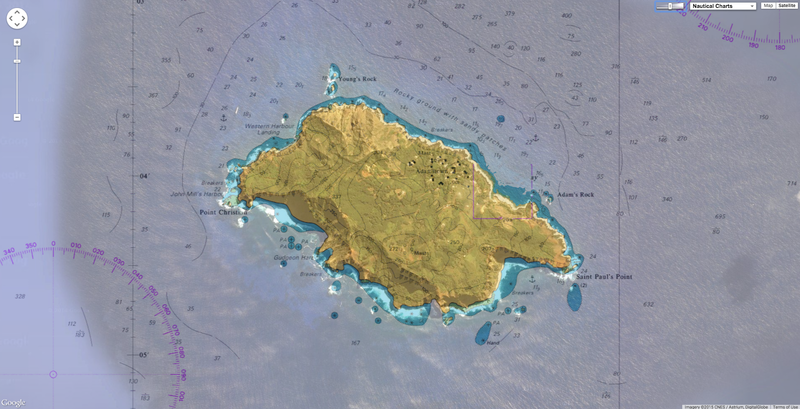 In September 2012, in response to the expedition, the Pitcairn Council voted unanimously to create a marine protected area in their entire economic zone, which extends 200 miles (322 kilometers) out from their four islands, three of which are uninhabited. Since the islands are administered by the U.K. as a territory, the new reserve required the support of the British government. “Pitcairn’s waters contain some of the few pristine coral reefs left on the planet,” says Sala. On the 2012 expedition, Sala and his team discovered several new species of fish by dropping cameras into deep water. A larger effort is likely to discover hundreds of new animals there, he says. “The Pitcairn Islands have some of the cleanest waters in the world,” Sala says. 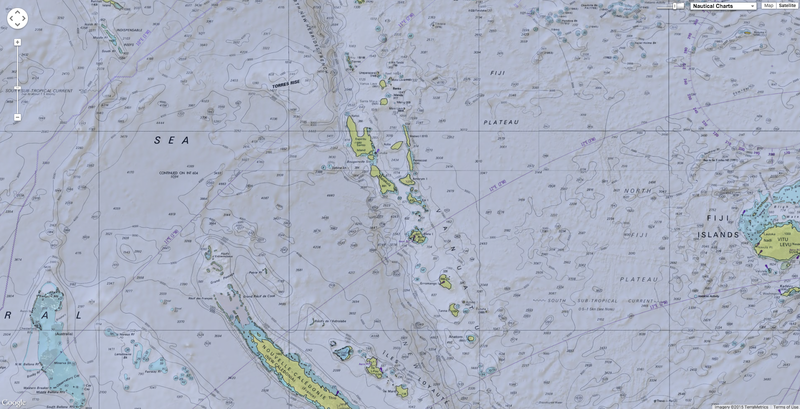 “And Ducie Atoll is as pristine as it gets,” he added, referring to the most remote of the islands. Sala's dive team could see for 250 feet (75 meters) and spied many sharks and a vast garden of pale blue coral that looked like giant roses. Pitcairn’s residents asked the U.K. government to create the reserve to thwart illegal fishing from foreign fleets, which have been encroaching on their territory. Around the neighboring islands of French Polynesia, many of the sharks have been fished out. To get there from Washington, D.C., takes five days on boats and airplanes. “That’s longer than it takes to get to the moon, but it was worth the trip,” he says. Only about one percent of the world’s ocean is protected in reserves that ban fishing. The Telegraph : Why will nobody move to Pitcairn, the Pacific island with free land? People in the Pacific Marshall Islands and Kiribati are facing oblivion as the sea around them rises, and they are already suffering from food shortages, droughts and floods. In 1946 an American commodore gathered Lirok Joash and her people together and asked them to temporarily leave their homes on Bikini Atoll. The US needed somewhere to test its atomic bombs. It would be, said the navy man, “for the good of mankind and to end all world wars”. Eight years later US scientists detonated Castle Bravo, the massive, bungled hydrogen bomb that would gouge a crater more than half a mile wide and make Bikini uninhabitable for decades, perhaps centuries. A calculating error created a blast equivalent to detonating 15 megatonnes of TNT, the bomb was the largest ever detonated by the United States – about 1,000 times larger than the bombs dropped on Hiroshima and Nagasaki at the end of the second world war. 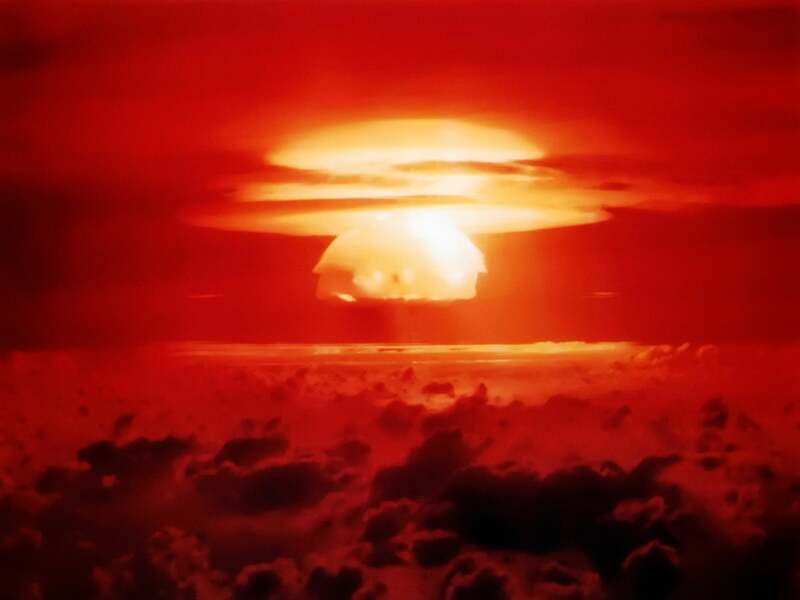 In 1954 the US detonated Castle Bravo - the most powerful nuclear device ever detonated by the US – on Bikini Atoll. Joash was 20-years-old when she left Bikini. She has been forced to relocate by radiation or unsuitable living conditions five times – including a brief and disastrous return to a still radioactive Bikini in the 1970s. Now, at 89, she is the oldest of the Bikini population forced to move by the nuclear tests. Her memories of the atoll have now grown dim. “I don’t think she’ll make it until the next return,” says Joash’s grandson Alson Kelen, a former mayor of the Bikinian council-in-exile. High tide completely surrounds Eita, South Tarawa. If the seas continue to rise at the current rate, it won’t be long before the villagers will have to relocate, as many have already done. The Bikinians, most of whom will never see Bikini, live scattered across the Marshall Islands, a collection of 24 atolls in the Western Pacific. 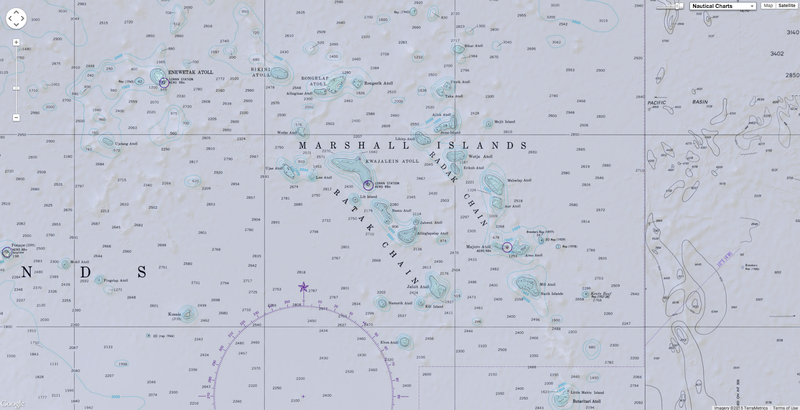 Joash, Kelen and 200 of their people now live on Ejit, a tiny low-lying islet set aside for the Bikinians near the Marshall Islands’ capital atoll Majuro. “We’ve been kicked around for a while, for the last almost 70 years,” says Kelen. And the ocean, driven by climate change, is rising. Across the Pacific, the subtle, unremitting first impacts of the climate crisis are already strangling lives. Later this year in Paris, the world’s leaders will attempt to produce an agreement that will secure the global climate. Floods washed over Ejit three times in 2014. Kelen fears that before long, his people will be moving again. “It’s the same story. Nuclear time, we were relocated. Climate change, we will be relocated. It’s the same harshness affecting us,” he says. In the Marshall Islands almost everyone lives within a few hundred metres of the sea and less than three metres above it. Inundations have destroyed homes and crops. Droughts of extraordinary intensity and length have necessitated food and water drops. 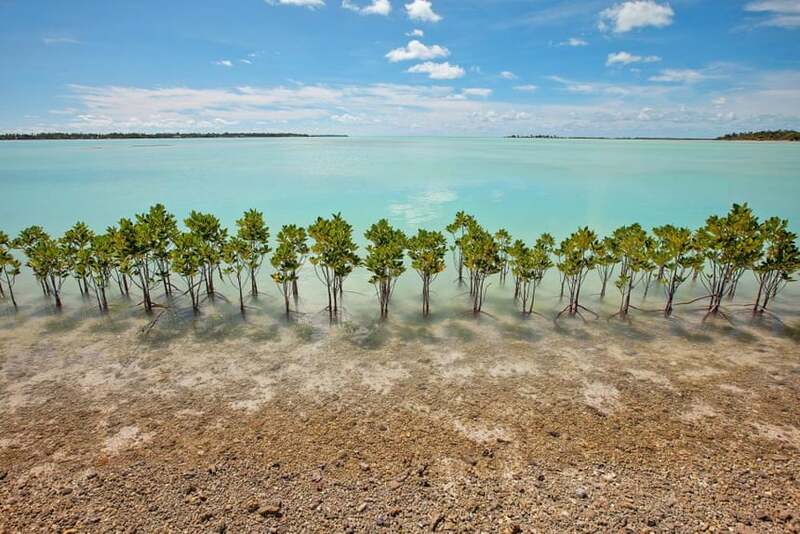 People are trying to defend their land by planting mangroves, and Sisyphean sea walls are built and rebuilt. But people’s thoughts are turning from adaptation and resilience toward a climate exodus. Scientists predict that in 30 years, life here will be so uncomfortable most people will leave. A notion the Marshallese abhor. The Bikinian calamity serves as a national warning that homelands, once lost, cannot be replaced. “If the land doesn’t exist, what happens to these people for whom the land is the most integral thing? For the answer, just look at the Bikinians,” says Jack Niedenthal, the liason officer for the Bikini Trust. Mangrove plantations are one of the methods used in the attempt to protect the land from the ocean. Their extensive root systems help build up sand and act as a buffer against storm surges. But politics and atmospheric physics are running away from the Marshallese. In March 2014 almost 100 homes on the capital atoll Majuro were destroyed by a combination of high tide and big swell. More than 900 people were placed in shelters. Families have since returned to live in homes half collapsed into the sea. “I can tell you right now that all of those [inundation] events that have occurred in the Marshall Islands can be attributed to sea level rise,” says Reginald White, the director of the Marshall Islands National Weather Service. On the pancake flat atolls, three centimetres of sea level rise will cause a flood to spread inland a further 30 metres. Reginald White, director of the Marshall Islands National Weather Service on the effects of sea level rise, with a timelapse of rising tides on Kiribati. The higher sea level combines with seasonal high tides (known as king tides), large swells and high winds to push water on to the land. During La Niña years (part of the couple of ocean-atmosphere phenomenon that affects weather globally and includes El Niño) the seas can rise up to 30cm above normal. The last decade of predominantly La Niña conditions has offered a bleak curtain raiser for things to come. “We are seeing more extreme events today than we used to see in the 60s, 70s and 80s. Even without La Niña we still receive inundations,” says White. Some scientists predict climate change will cause more intense and more frequent El Niño and La Niña events – although this is less certain than sea level rise. El Niño events are typically followed by dry periods in the Marshall Islands. During 2013, after a very weak El Niño, the northern atolls were hit by a severe drought. Food and water were delivered to desperate communities. Production of coconut oil, one of the countries only exports, fell by almost a third, a loss of close to US$2.5m (£1.6m) or 1.5% of GDP. “If there is another drought then the industry will be gone. That will really effect everything here,” says Mison Levai, the marketing manager of the national coconut oil producer Tobolar. This will not only be bad news for the 70 employees of Tobolar’s refinery in Majuro. For the 20,000 people who live on the rural coconut-growing ‘outer atolls’ the equation is simple. On the outer atoll of Arno, families work together every day, six days a week, collecting fallen drupes, removing the husks, skilfully shucking the flesh (called copra) and drying it in makeshift ovens. It is then shipped to Majuro to be turned into oil and exported. Torrak Anton, a copra farmer, uses a stick to scratch the arithmetic of his poverty in the dirt of the road. After food, rent and contributions to the copra dealer and island chief, he is left with $34 a week for the seven people in his household. During times of drought the coconuts shrink and the money for clothing, housing and education disappears. Without copra, outer islanders will be reduced to a subsistence survival, eked from the land, supplemented by fishing and likely made impossible by tidal inundations. Already 1,200-1,400 people are reported to have moved from rural atolls to district centres – exacerbating overcrowding and making flooding in the capital Majuro more damaging. Depending on how sharply the world cuts carbon emissions, the Intergovernmental Panel on Climate Change (IPCC) predicts the global mean sea level will rise by 26-82cm between now and 2100. The IPCC concluded in 2013 that even if the increasingly quixotic-looking “safe” limit of 2C of global warming were somehow achieved by the Paris talks, the sea would continue to wash over Kiribati and the Marshall Islands. What the rest of the world considers acceptable climate change is, quite simply, a disaster for atoll dwellers. In spite of De Brum’s refusal to countenance a national evacuation, White says the Marshall Islands are likely to become unliveable for all but a hardy few before the midway point of this century. “What is the exact definition of habitable? It gets to a point where the extreme events become so frequent that it becomes very uncomfortable to make a good living,” he says. 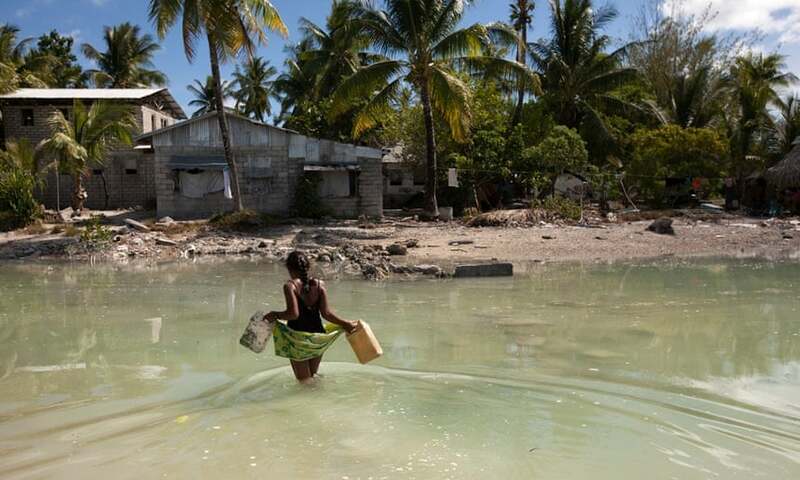 The people of Kiribati (pronounced Ki-ri-bas) are the Marshall Islands’ fellows on the low road to climate oblivion. 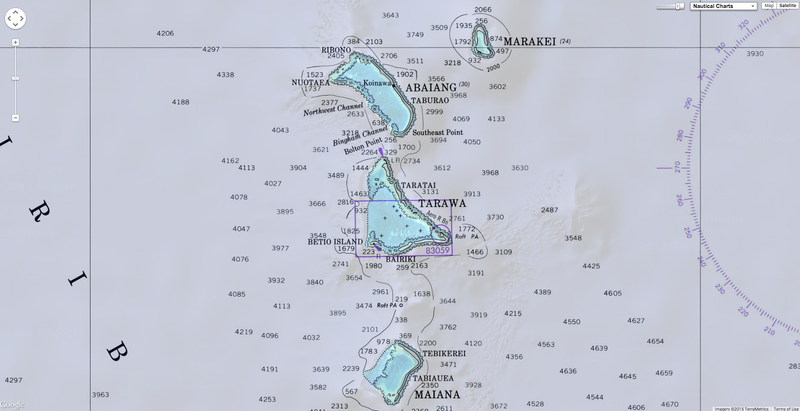 The capital atoll Tarawa is overcrowded and underdeveloped, even compared to Majuro. Rita Kaimwata, a 27-year-old mother of two (soon to be three), lives in a typical Kiribati home of driftwood, salvaged timber and palm thatching. Her tiny block of land in the village of Temwaiku is separated from the Pacific Ocean by a thin dirt road and a hump of sand less than a metre high. Like many Tarawans, the Kaimwata’s access to food and fresh water is tenuous. Their diet of rice and fish is supplemented by whatever vegetables they can grow. Every second day, for one hour, the government pumps treated drinking water and the family fill up a small tank. This precious water must be kept for keeping hydrated in the punishing equatorial heat. For bathing, dishes, clothes and watering vegetables there is a well that taps the thin layer of fresh water (called a lens) a couple of metres below the ground. But last year (and again a few months ago) the sea swept over the road, through the Kaimwata’s home, across their cabbages and into the well. 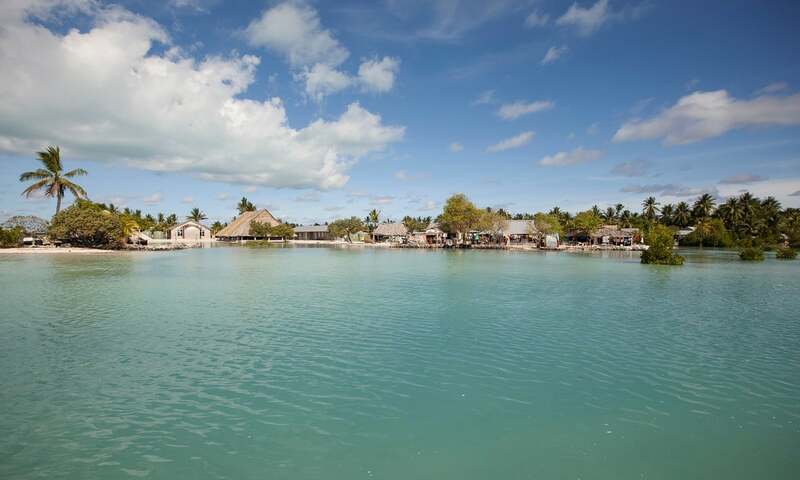 Kiribati islander Tokeman Tekaakau’s house is threatened by the rising tides. Set against scientific warnings of a future of catastrophic climate change events (such as typhoon Haiyan and hurricane Sandy) the loss of a vegetable patch seems insignificant. But for Kaimwata’s children the link between food, water and rising sea levels is profound and the margin between life and death could be as fine as the ability to grow a few cabbages. Kaimwata, like many residents (called i-Kiribati), giggles to hide distress. Devoid of rock and substantial natural defences, this is among the most marginal of all regular human habitats. Nearly a decade of regular inundations has caused parts of Tarawa’s already thin and polluted water lens to turn salty. Clean water is almost non-existent. Between 2005 and 2010, the number of malnourished multiplied eight times. In September, an outbreak of rotavirus from bad water infected 2,513 children under five years old. Seven were killed. More than a third of i-Kiribati are under 15. The water situation is desperate. Water is being drawn from the freshwater lens 20% faster than rain replaces it. Bacteria from open defecation (there are few toilets), industrial and domestic chemicals and seawater contaminate all water sources – including the government supply. Only 60% of the atoll’s population receive rations of ‘clean’ government water. The other 23,000 rely solely on well water that Tarawa’s director of public health Patrick Timeon describes as “grossly unsafe”. “The enormity of water-associated disease and death has not been fully assessed,” says Timeon, but the direct and indirect impacts are “colossal”. He begs for assistance to raise just £70,000 for two desalination plants that could provide safe water to the entire population. Building a sea wall on Kiribati. Kiribati’s president Anote Tong is frank. Years of failed talks and prevarication by industrialised countries have shaken his belief in the UN process. The land, homes and futures of his people (like the Bikinians before them) have been deemed the price of doing business, the acceptable cost of delaying the end of the carbon economy. In contrast to De Brum, he is already working on encouraging his people to leave. “If what will happen in Paris will deal with the case of the most vulnerable countries like us, then maybe we have some guarantee that we will be able to stay. But if we don’t, I’m not going to put the future of my country on the outcome and the whims and wishes of those countries to decide. We’ve got to plan ahead. The old saying wish for the best but plan for the worst,” he says. The countries’ contrary rhetoric on climate change is partly informed by their differing migration opportunities. The Marshallese have a compact of free association with the US, meaning they can resettle as they wish. But the i-Kiribati have few avenues of emigration. Tong’s despairing statements are partly designed to goad Kiribati’s major donor countries Australia and New Zealand to open their borders to his people. His plan for the worst, encourages young people to learn a profession and ‘migrate with dignity’. “We have to relocate people because the landmass is going to decline. That’s common sense. Simple common sense … I can say that I refuse to move, but that’s being stupid isn’t it? Because it will not be me that will be affected. It will be my grandchildren,” he says. Even now, it is not difficult to find the suffering grandchildren of Kiribati. Between Tong’s modest parliament and Kaimwata’s home is Tarawa’s hospital. The overloaded facility desperately needs modernisation and expansion. People sleep on the floor or outside on the ground. Cats roam the wards and ants swarm around dripping taps. In a corner of the paediatrics wing, panting slowly in the heat, lies one-year-old Atanimatang Atanimatang. He fell sick during the rotavirus outbreak in September and his little body has wrestled against the diarrhoea and fever caused by the virus for four months. He shows signs of kwashiorkor, a type of malnutrition commonly found in regions hit by famine. His mother Katewea Atanimatang watches her son’s febrile sleep. They receive government water, she says, but when it is not available they are forced to drink from the well. She looks exhausted and sad. When I contacted one of his nurses in the days before publication, Atanimatang had recovered slightly. He may yet live long enough to go to school, attend church, marry and have children - like most other i-Kiribati and Marshallese. But if he does, it’s likely he’ll also live to see his homeland evacuated. The elders are distraught that this loss is being committed to their young. The Reverend Eria Maerierie is an old man. He won’t live to see his country’s loss. But he has a long enough memory to know that things have changed. If the tide is high on a Sunday he now conducts services in a church surrounded by water. And he rages against the apathy behind the rising sea. A young girl crosses the lagoon at high tide to get some water for her family, who live on a thin strip of sand that gets cut off from the main island every high tide. The most widely-reported and possibly most misleading ‘effect of climate change’ in atoll nations is erosion. It’s a striking, media-friendly narrative, climate change we can see. Homes undermined by rising seas, beaches scoured back to the coral shelf and coconut trees felled by salt poisoning. But the evidence showing a clear link between the last century of sea level rise and erosion is far from conclusive. Research on the erosion of atolls really only began in 2011. The University of Aukland’s Murray Ford has compared aerial photography from the second world war with current satellite images and the results may surprise some. Despite a small but significant sea level rise of 20cm last century, Ford found that the last half of the century saw a general (although not uniform) trend of accretion across 100 Pacific atolls. 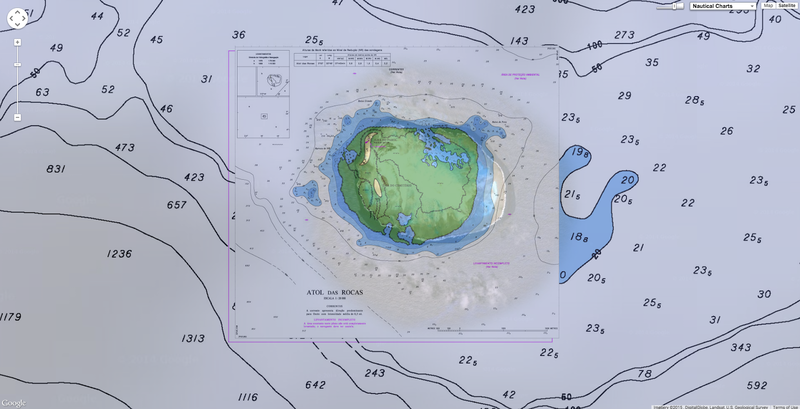 The islands are getting bigger. “All the research that’s come out in the last few years has shown that the islands aren’t eroding away. It’s kind of counter intuitive,” says Ford. Rather than being the indisputable first effects of climate change, all the photos of dead palms and disappearing beaches attest to the extreme fragility of these landforms to change. It is likely that on densely-populated Tarawa and Majuro, causeways, shoreline developments and dredging have much more influence on local erosion than sea level. Confirmation bias also plays a part in both the islanders’ perceptions and the reporting from these islands. The eye isn’t drawn so easily to the places where the sand is piling up. Any erosion is accepted as proof of the climate change narrative. But just because the islands are growing now, doesn’t mean they won’t suddenly begin eroding when the sea reaches a certain height. At the moment though, the disappearance of land is less of a threat than the loss of habitable land, says Ford. “The inundation risk continues to rise and it’s highly likely that they’ll be frequently inundated well before they are eroded away,” he says. Days after it added stunning imagery of Mount Everest, Google Street View has been updated with beautiful photos from the other side of the world — the Brazilian islands of Fernando de Noronha and Atol das Rocas. The new imagery includes both underwater and land photos of the UNESCO-protected islands, which tourists can only access in limited groups. On Fernando de Noronha, a group of islands in the Atlantic some 220 miles offshore form the Brazilian coast, you'll find some of the most beautiful surf spots in the world, as well as some amazing beaches and interesting rock formations. The Atol das Rocas is situated around 50 miles to the east of Fernando de Noronha. It also offers some spectacular beaches, but the real thrills are located underneath the ocean's surface. In the new Street View imagery, you can see dolphins swimming through the Canal de Sela Gineta (below) and sea turtles swimming at Buraco das Cabras. As usual, besides taking the usual route of exploring through Google Maps' Street View feature, you can also check out the coolest sites from these locations in Google's highlights gallery. The “monster” cyclone that hammered a tiny South Pacific archipelago over the weekend was caused by climate change, it was claimed today. As aid began trickling into the devastated island community, Vanuatu’s president Baldwin Lonsdale told gathered reporters that his country – among the poorest in the world – would have to “start over” as previous development had been “wiped out” by Cyclone Pam. NASA's Terra satellite captured this visible image of Tropical Cyclone Pam showing her eye in the South Pacific Ocean on March 11 at 22:50 UTC. “We see the level of sea rise … the cyclone seasons, the warm, the rain, all this is affected … This year we have more than in any year … yes, climate change is contributing to this,” he told reporters. Although the storm has passed over the islands, travelling in the direction of New Zealand, officials are struggling to access the full extent of the damage after winds of up to 168mph tore over the land, home to 267,000 people, on Saturday. 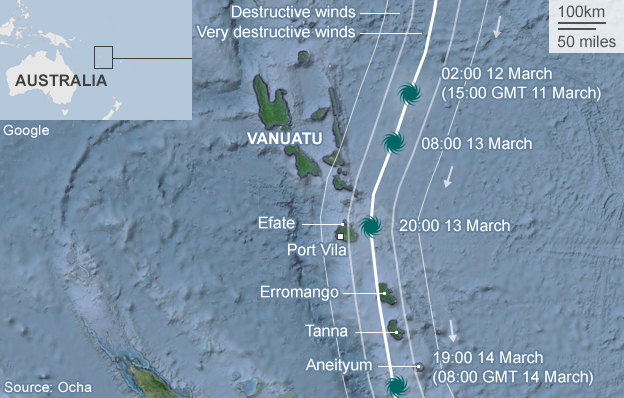 "This is a very devastating cyclone in Vanuatu. I term it as a monster, a monster," Mr Lonsdale said from Sendai, Japan, where he had been attending a UN disaster conference when the cyclone struck. He will return to his country today. "It's a setback for the government and for the people of Vanuatu. After all the development that has taken place, all this development has been wiped out." Officials have been unable to contact outlying islands as communications have fallen making a proper assessment of Vanuata’s 65 islands impossible. "We do not know if our families are safe or not. As the leader of the nation, my whole heart is for the people, the nation," the president said, adding he had been unable to discover if his own family was safe. There have been reports of entire villages disappearing. An Australian Red Cross official claimed: "Virtually every building that is not concrete has been flattened." Today, the coordinator of Vanuatu’s National Disaster Management Office Paolo Malatu said he plans to send what little light aircraft possessed by the government to fly over the outer islands. "The damage to homes and infrastructure is severe," Mr Malatu said. "The priority at the moment is to get people water, food and shelter." The UK and France, previous rulers of the tiny nation until 1980, have pledged aid. Australia has promised A$5 million and also sent medical experts, emergency supplies and a search and rescue team. The humanitarian crisis in the Mediterranean Sea is spiralling out of control. Thousands of people lost their lives during 2014 while attempting to cross the Mediterranean from North Africa. There is a risk of further catastrophic losses of life as more desperate people attempt this dangerous sea crossing. The UNHCR – the UN High Commissioner for Refugees stated, ‘At least 218,000 people, including migrants and refugees, crossed the Mediterranean by irregular routes in 2014 and this trend is expected to continue in 2015. That is approximately one in every 60 people. EU Member States must act urgently to prevent the loss of thousands more lives, as hundreds of thousands of migrants and refugees seek to escape to Europe in boats that are unfit for purpose and which are largely operated by people smugglers. This is the key message which the International Chamber of Shipping (ICS), the principal global trade association for ship operators, delivered to a high-level United Nations inter-agency meeting on the crisis, hosted by the International Maritime Organization (IMO) in London on 4th March. 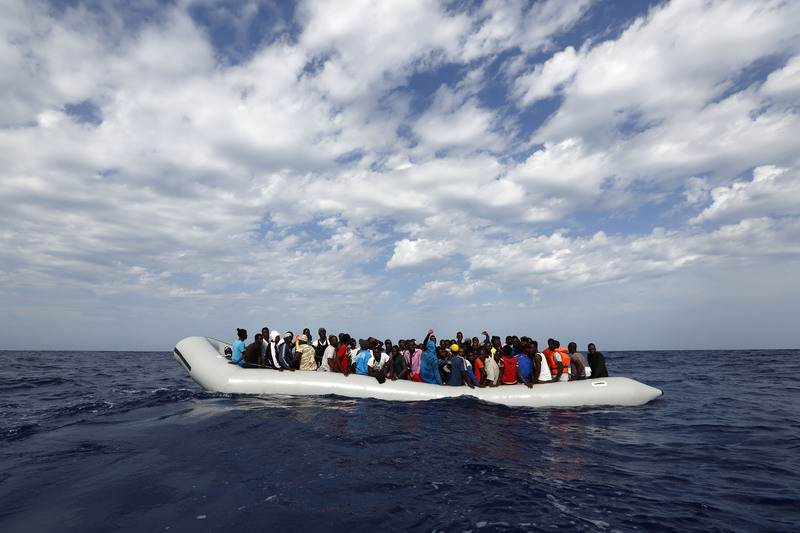 Merchant ships rescued around 40,000 people during 2014, according to the UNHCR. But this number is predicted to increase dramatically during 2015 if the political situation in Africa and the Middle East further deteriorates. ICS says that the burden of responsibility placed on ships and their crews to rescue migrants in distress has been further increased by the replacement of Italy’s humanitarian ‘Mare Nostrum’ operation with the EU funded ‘Triton’ operation, whose primary mandate is border protection and which operates with very limited resources. The shipping industry’s concern is that, following the end of Mare Nostrum, other governments are increasingly relying on merchant ships to undertake more and more large-scale rescues. ICS says it is also concerned by the more recent phenomenon of ships full of migrants being left to navigate in congested waters without qualified persons in charge, presenting a danger to seafarers in other ships as well as the migrants themselves. Coastal States have Search and Rescue (SAR) obligations under international law but as the situation gets worse, ICS believes that unless concerted action is taken to prevent criminals from using unsafe craft to transport migrants there must be a massive increase in State funded resources for SAR operations to meet the growing need in the Mediterranean. In practice, says ICS, this means that other EU Member States need to share the burden in order to help prevent thousands more deaths. The international shipping industry fully accepts its legal obligations to come to the assistance of anyone in distress at sea. However, some ships have had to rescue as many as 500 people at a time, with serious implications for the welfare of ships’ crews given the health and security issues involved in dealing with such large numbers. While far more needs to be done to prevent the boats used by people smugglers from being able to depart in the first place, the lawless situation in nations such as Libya and Syria makes this very difficult. ICS therefore believes there is an urgent need for European States and the international community to develop a political solution. In the short term, however, ICS insists that EU Member States need to do far more to support the Italian Search and Rescue operation, as well as nations such as Greece, Malta, Cyprus and Turkey which are also on the front line of this problem. The very large number of rescues being conducted by merchant ships is a situation which ICS says is becoming increasingly untenable. ICS has published new Guidance on Large Scale Rescue Operations at Sea, which can be downloaded free of charge via the ICS website. According to the UK based International Maritime Rescue Federation (IMRF) this pressure on merchant vessels is unsustainable and coastal States, and States responsible for search and rescue (SAR) in the regions where the rescues takes place, must do much more to help. The IMRF said the SAR community had major concerns considering that the number needed to be rescued in this year is expected to escalate to 400,000. Funding of SAR services is reducing, meaning merchant ships had to save 42,000 people during 254 rescues. Already this year 7500 people have been rescued. Following the United Nations inter-agency meeting on the crisis, hosted by the IMO in London on 4th March, IMRF CEO Bruce Reid said, ‘This was never the purpose of the International Convention for the Safety of Life at Sea (SOLAS) agreement and is of major concern to all our members. We fully appreciate the difficulties of the shipping industry in this matter. Ships’ masters are required, by international maritime agreements and regulations, to rescue people in distress if they can. It does not – and must not – matter who those people are or where they have come from. That is the law and tradition of the sea, and we must ensure that it is maintained, for there are many circumstances in which only ships in the area will be able to carry out a rescue. Yet here we have a situation in which people are deliberately being placed in a position of distress, to trigger a rescue response. This obviously places ships’ masters in an invidious position. As part of a rapid response to the situation in the Med an independent Search and Rescue operation MOAS (Migrant Offshore Aid Station) has been created with private funds to assist naval, commercial and private mariners to carry out rescue and life saving at sea. The Migrant Offshore Aid Station is a registered Foundation (VO/0939) based in Malta. MOAS was founded in 2013 by Christopher Catrambone (from New Orleans, USA) and Regina Catrambone (from Reggio Calabria, Italy) following the loss at sea of hundreds of migrants off the Italian island of Lampedusa. MOAS is headed by Brigadier (Retired) Martin Xuereb, who was Malta's Chief of Defence until 2014. He coordinates a team of seafarers and SAR professionals. The organisation is dedicated to preventing loss of life at sea by providing assistance, coordination and support to maritime rescue operations. During just 60 days in 2014 MOAS provided life-saving rescue and medical assistance to 3000 people at sea. MOAS have no political affiliation or agenda other than the professional saving of lives at sea. Their mantra is ‘no one deserves to die at sea’. MOAS is a NGO (Non Government Organisation) funded by donations. Contributions show that many private individuals and organisations want to be part of the solution to the humanitarian crisis in the Med. Depending on the level of public donations MOAS plans to spend six months at sea in 2015. MOAS is equipped with a 40 metre (130 feet) vessel 'Phoenix', two Remote Piloted Aircraft (Schiebel camcopters) and two RHIBs, plus an experienced team of rescuers and paramedics. MOAS supports search and rescue efforts in the Mediterranean Sea by locating vessels in distress. First the appropriate official Rescue Coordination Centre is informed, MOAS then assists as directed or as required by the situation. All seafarers transiting the Mediterranean will be affected by the numbers of refugees crossing from Libya to Italy. Christopher Catrambone said, ‘due to the sheer number of migrant boats and the lack of EU assets to intercept them, commercial vessels have become the first line of defence in rescues. Catrambone continued, ‘They do not have medical personnel so they are unfamiliar on how to take care of the people involved. And this is a big part of the process, not only rescuing them but taking care of them after they’ve been rescued which can be critical to their lives, as we’ve learned in Lampedusa. MOAS has launched an urgent appeal for funds following the February 2015 tragedies in which 300 migrants drowned and more died of hypothermia after being rescued in the Mediterranean between North Africa and Southern Italy. According to reports, in February 2015 three rubber dinghies crammed beyond capacity by smugglers with hundreds of migrants left Libya. The first responder was a small tug boat which waited some two hours for naval help from Operation Triton, by which time many were already dead or dying. After around 100 people were rescued, at least 29 died from hypothermia on their way to the island of Lampedusa. During May to October 2015, MOAS intends to position the vessel ‘Phoenix’ in major migrant shipping lanes. Using Remote Piloted Aircraft with sonar, thermal, and night imaging the crew will monitor the area to locate migrant vessels in distress. The appropriate Rescue Coordination Centre will then be informed. The MOAS crew will then assess the migrants’ needs using two RHIBs stocked with water, non-perishable food, life jackets, blankets and medical supplies. If they encounter someone who needs urgent medical care, or a vessel in danger of sinking, they will stabilize the person or vessel until public authorities arrive and better care becomes available. MOAS consists of international humanitarians, security professionals, medical staff, and experienced maritime officers who have come together to help prevent further catastrophes at sea. They are passionate about the plight of those seeking a better life, despite the dangers they face at sea. MOAS acts as an aid station to support vessels in need of assistance, coordinating its efforts with other search and rescue authorities around the Mediterranean. The ultimate aim is to mitigate loss of life at sea. It will not act as a migrant ferry and it will not rescue migrants exclusively, but it will use all its resources to assist appropriate official Rescue Coordination Centres to locate and help reduce the suffering of human beings and save lives where possible. MOAS operates in full compliance with relevant EU law, including the Charter of Fundamental Rights, and relevant international law. From the mariner’s perspective there are basic survival and humanitarian issues at sea level. There clearly are significant political and regional security viewpoints that also need to be considered. There are parallels with maritime piracy, where many different views from land are relevant, but at the end of the day action has to be taken by captains and their crews at sea. Any mariner transiting the Mediterranean in any size of vessel including tankers, cruise ships, super yachts and even small private boats could get caught up in this situation. Rapid response is essential to rescue people at sea and captains will be faced with hard decisions. They are going to have to consider whether they take people onboard or stand by to wait for professional rescuers, while still maintaining the safety of their crew, plus the security of their vessel and cargo. 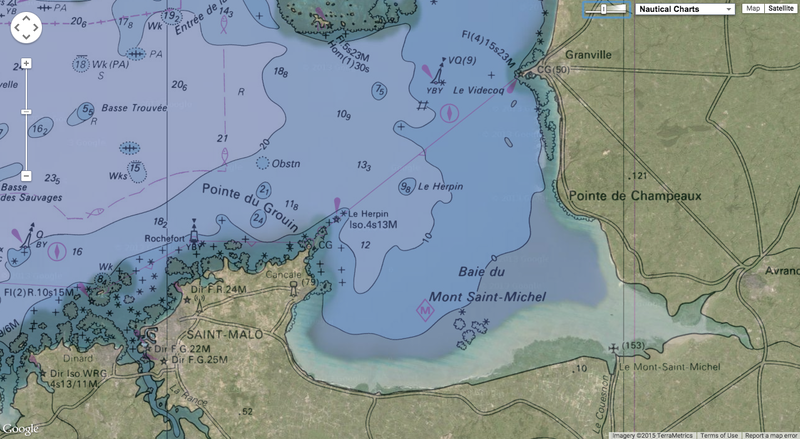 Mariners will need a clear course of action in their standard operating procedures and a clearly defined SAR, coast guard or naval contact for assistance in each sea area of The Mediterranean. Isn’t it always about that? In this video we might think that we see everything at the beginning, but as we get closer there is a little detail which we didn’t see at first and which we can get very close to.